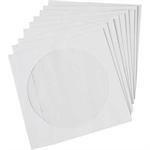 5 x 7 1/2 Open End Bright White Envelopes — 24lb. 4 5/8 x 6 3/4 Open End Bright White Envelopes — 24lb. 4 5/8 x 6 3/4 Open End Brown Kraft Envelopes — 24lb.